Is the “Greening” of Avondale a Good Thing? The images that accompany this post are fairly explicit, yet there’s something beneath the surface. They show what once was a modest home under significant renovation, actually a gut rehab. The homes that flank the one under rehab also were ungraded in the past few years. In fact, as depicted, the contractors working on this home have literally raised the roof. The dumpster shown is one of perhaps five dumpsters workers have filled with debris removed from this century-old structure the past four months. Hope they get the roof installed before it rains. We are in April. Located just a few doors north of our modest home in Chicago’s suddenly hip Avondale neighborhood, this home once was owned by an elderly women; then it sat vacant for a few years. For the past two or so years, and man and his family lived there. Now, it’s undergoing renovation that will cost tens of thousands of dollars. A neighbor estimated the home will be put on the market for around $650,000. And, I think he’s right. Ah, the sign of progress: A dumpster. On the surface, this project is a good thing for the neighborhood, a good thing for Chicago and a good thing for me. 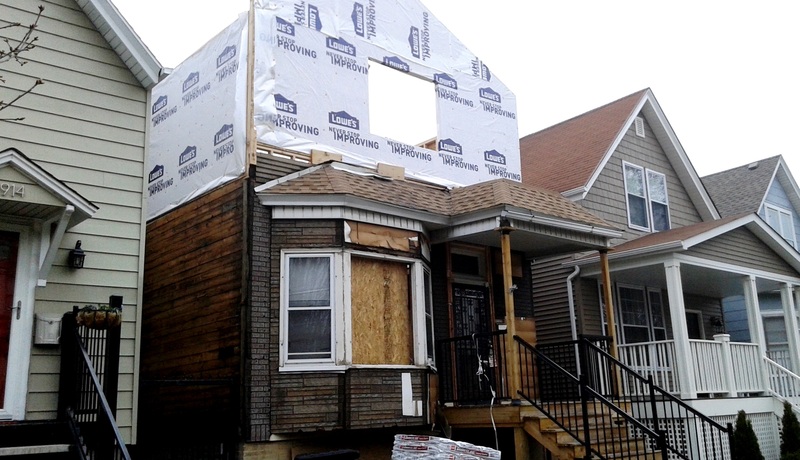 Rehab projects preserve the character of the neighborhood and contribute to the housing stock. 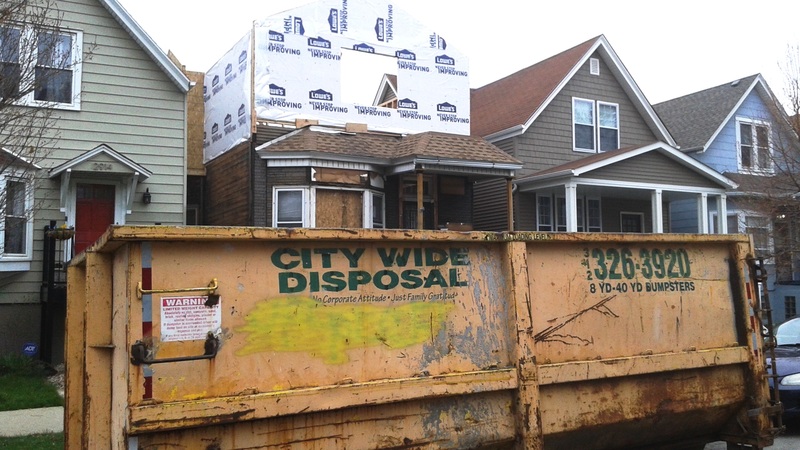 The city gets another property back on the tax rolls — at assuredly a higher valuation than before the work was done. And, the value of our home most certainly will rise. But I wonder if examples of this type of “greening” or rebirth — okay, call it “gentrification” –is changing our corner of Chicago entirely for the better. Is Avondale now a “destination?” Or will it remain a neighborhood? Yes, the neighborhood is safer, quieter and cleaner than it was when we moved here 15 years ago. New merchants are opening businesses nearby, escaping the higher rents in Lincoln Park, Lakeview, Wicker Park/Bucktown and West Town — where I lived for the first 19 years of my life. Yes, there’s a growing sense of community here. Still, I don’t envision the future owners of this home-down-the-block staying in Avondale for the next 15 years. Perhaps it’s how society is changing, but to me many people today use a place for what it’s worth, then move on. I do look forward to meeting the people who will move into this home-down-the-block. I hope they’ll cherish the home, perhaps as much as the elderly woman who lived there for many years. 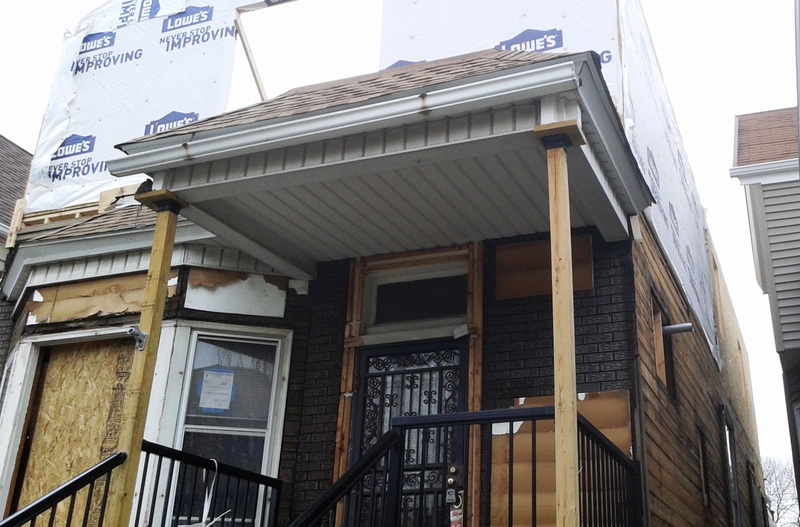 This entry was posted in Uncategorized and tagged Avondale, Avondale/Logan Square, Chicago rehabbed housing, Gentrifying Chicago neighborhoods, housing in Chicago. Bookmark the permalink.